Get the VS Code experience in your browser. Introductory post here. In beta until the release of Chrome 61, 6.1 has a smaller binary, includes some significant performance improvements when iterating over maps and sets, and asm.js code is now transpiled to WebAssembly. Multi-directional scrolling with a fixed header, paging, grouping and editing data in cells are just a few of the capabilities of the ExtReact grid. 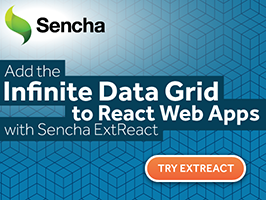 Try ExtReact for free to see how easy it is to add the grid and many other components into your apps. Nuxt.js is a framework for bringing server-side rendering (SSR) to your Vue.js apps, similar to how Next.js does with React. A practical introduction to service workers (scripts that run in the background separate from a Web page context) and how to easily create one using Ember. To implement first-class support for WebAssembly. Learn more about the talks and workshops at this year's Polymer Summit, and see who our amazing speakers are. With a new JS library that runs Google’s TensorFlow in the browser. Provides an alternative to endless null checks. Understand how v-model works on native inputs and custom components.